Are you aware that American Ribbon has more than ribbon? We carry trims, buttons, yarn, headliner, tassels, plastics, vinyl, pillow forms, foam for cushions and so much more! Need a certain pattern? We can try to locate it for you. In addition we carry a full line of upholstery fabric. Lastly Quilters just love our selection of supplies. So please come visit us. Please contact us for Store Information. 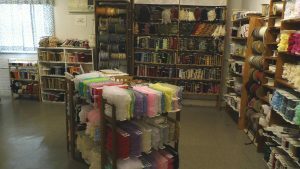 Visit us at 925 Ann Street, Stroudsburg PA 18360 The fabric store is located in our retail ribbon store, which makes it very convenient to do one stop shopping.